"Gold Fever! 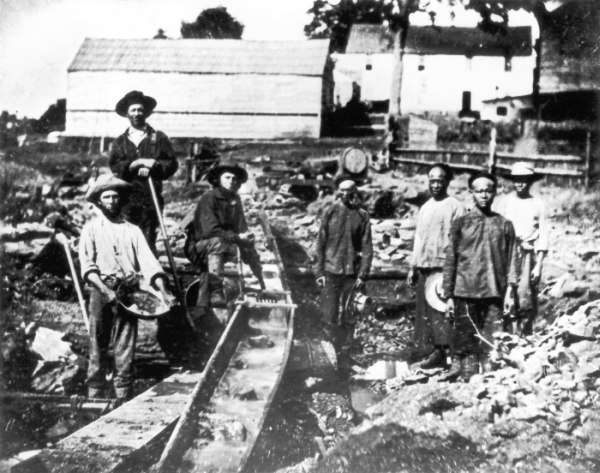 The Untold Stories of California's Gold Rush"
It has been more than 160 years since the Gold Rush galvanized California, “Gold Fever!” is sweeping into Merced County. This time in “Gold Fever! The Untold Stories of California’s Gold Rush” a fascinating exhibition that presents a treasury of Gold Rush era events, images and documents. The traveling exhibit will open for a 7-week run on March 17 at 5 p.m. at the Merced County Courthouse Museum. At the exhibit opening, Merced author and educator Eugene Hart will give a PowerPoint presentation entitled, “A Gold Seeker on the Merced River in 1849,” at 6 p.m. Transportation grants are available for schools to bring students from 4th to 11th grades to tour the exhibit. Please call 723-2401 for more information about the exhibit and grants. Twenty-four photo-mural panels present 1,000 square feet of fascinating text and representations of primary documents, photographs, daguerreotypes, and Gold Rush era paintings. The exhibit examines California before the fateful discovery of gold in the American River, the frenzied rush to the gold fields overland and by sea, the experience of vigilante justice, life in the rowdy gold camps, Gold Rush era commerce and farming, and the shaping of California’s future. The exhibition spotlights the remarkable stories of individual Californios, women, Native Americans, and adventurers and gold seekers who emigrated from all parts of the world during the tumultuous and colorful Gold Rush era, and examines the impact James Marshall’s discovery continues to have on all of California’s people, cultures, environment, politics and economy. The “Gold Fever! The Untold Stories of the California Gold Rush” traveling exhibition tour was organized by Exhibit Envoy in partnership with the Cal Humanities. Exhibit Envoy provides traveling exhibitions and professional services to museums throughout California. Its mission is to build new perspectives among Californians, create innovative exhibitions and solutions, and advance institutions in service to their communities. Miners Near Nevada City, 1852. Photographer Unknown. Collection of the California State Library. 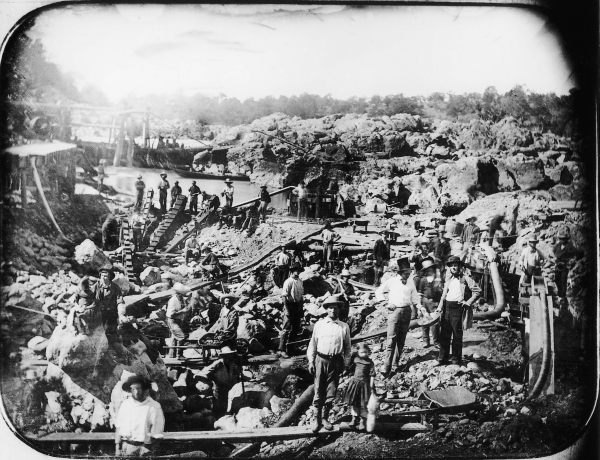 Mining on the American River, 1852. Whole plate daguerreotype by George H. Johnson. Collection of Matthew R. Isenburg.